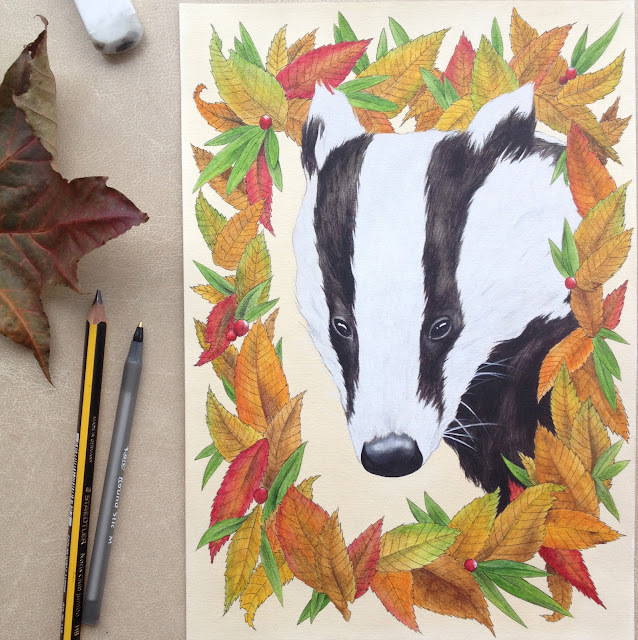 A recent piece I have been working on, inspired by my favourite season; Autumn, is the elaborately named 'Badger'. I thought it would be nice to work on something responding to the current season, and after a long walk collecting fallen leaves I decided the Badger was a topic I'd never touched on, and something I'd never actually drawn before. So the Autumnal Badger was born. I wanted to give the impression that the Badger was framed by his environment and surroundings, embracing the forest and at one with the leaves. But also, drew on the idea of the Badger in his Sett hunkering down for the hard winter ahead. Its made a nice change to work on something vaguely 'seasonal' and finally paint my beloved Badger at long last.